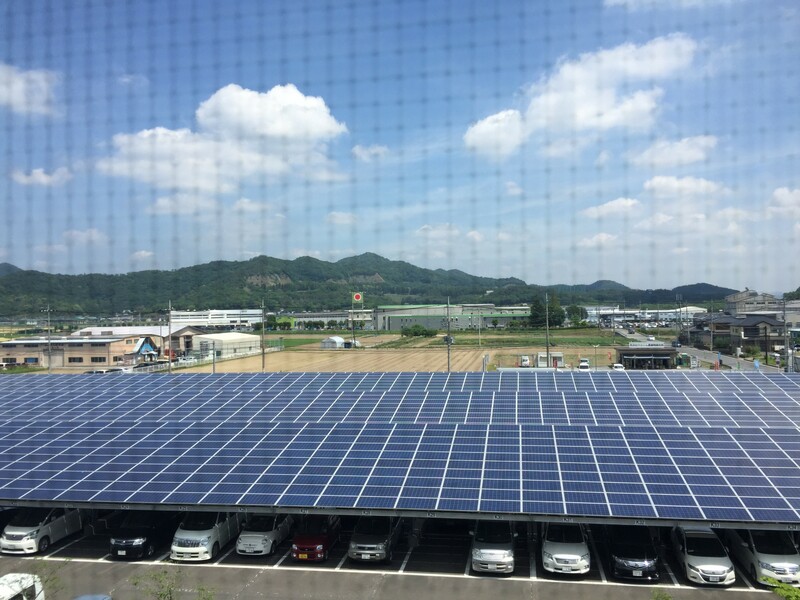 Here is another installment in my series of posts about “Life in Japan”. One of the surprising things about moving to Japan is how much the country Japan remains a paper-money based society. This is one of the big contradictions and contrasts that I find in everyday life here. It’s hard to believe how much cash I carry around – and go through – every week! I visit one of these at least once a week…or more! I’m always grateful that Japan is as safe of a place as it is, as I’m never worried about theft (safety of Japan will be the topic of another post). Many restaurants that take credit cards in the evening insist on cash payment during the day, many stores flat-out don’t take credit cards. If you go outside of Tokyo it’s even more acute. For example, a train station about 100 kilometers away from Tokyo would only take cash to book train tickets (totaling about $100). If I hadn’t had my regular stash of cash, we would have been in trouble! Have you ever visited a country in the past five years where your bank card wasn’t accepted? Until coming to Japan, I hadn’t! I haven’t used a money exchange or travelers checks in at least 20 years…. No matter what country I visit, I just go to an ATM upon arrival and am set. Not so much for visiting Japan! 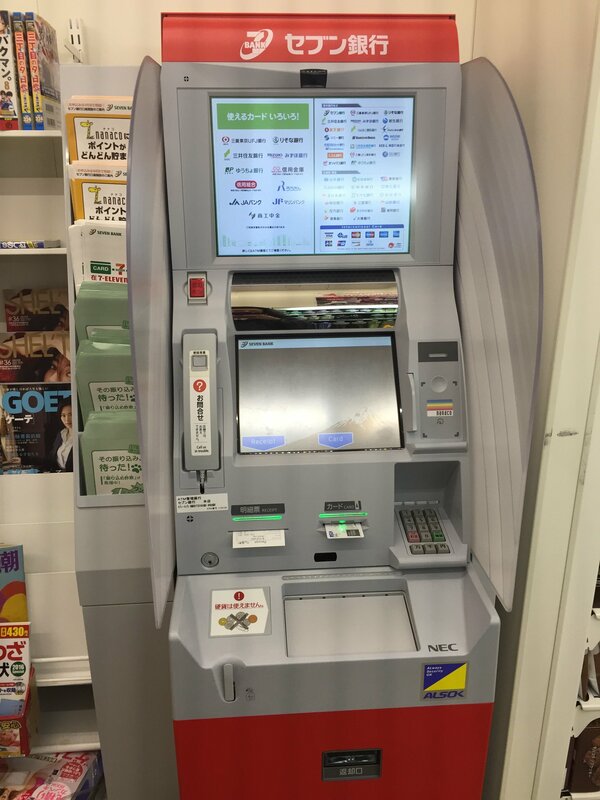 Even more challenging as a foreigner (or “gaijin”) in Japan, I cannot use regular Japanese ATMs to withdraw money. For whatever reason, Japanese banks do not usually accept foreign ATM cards. Have you ever seen this in another country? 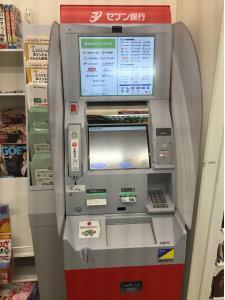 This poses a real challenge as a Japanese resident who does not have access to a Japanese bank (see below) and has to withdraw money regularly to survive in this cash-based life. Only ATMs at 7-Eleven stores and former Citibank branches (Citibank was just bought by a Japanese bank called Aeon, so it’s unknown what will happen to these ATMs) will process foreign ATM cards. With the high use of cash and limited access to ATMs, I go to 7-Elevens more than I ever would have imagined! We make at least a weekly – if not more frequent – visit. We were just in Hokkaido (Japan’s northern island) over New Years. A ski resort town popular with Australians and other foreigners has only one ATM in the whole town. 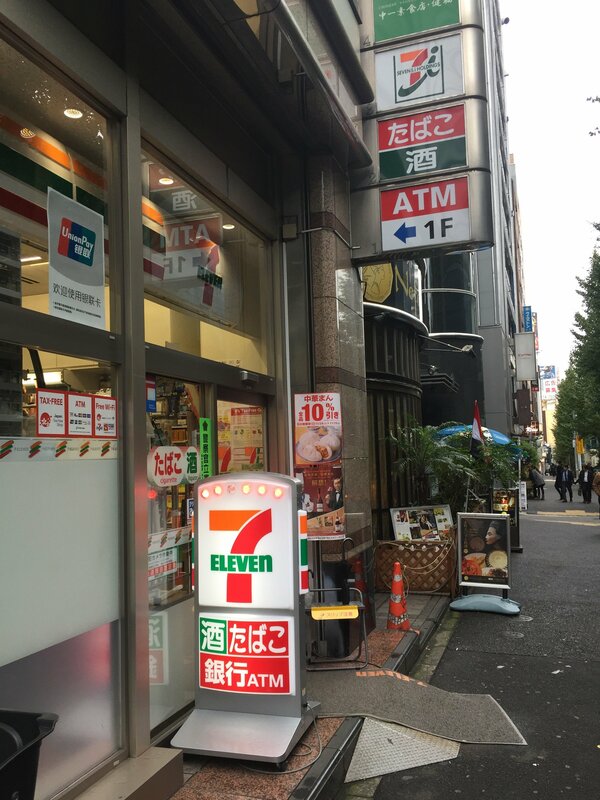 This ATM is actually just a stand-alone 7-Eleven ATM inside of a hotel, not inside of a 7-Eleven store. The line was long at all times to get access to cash! 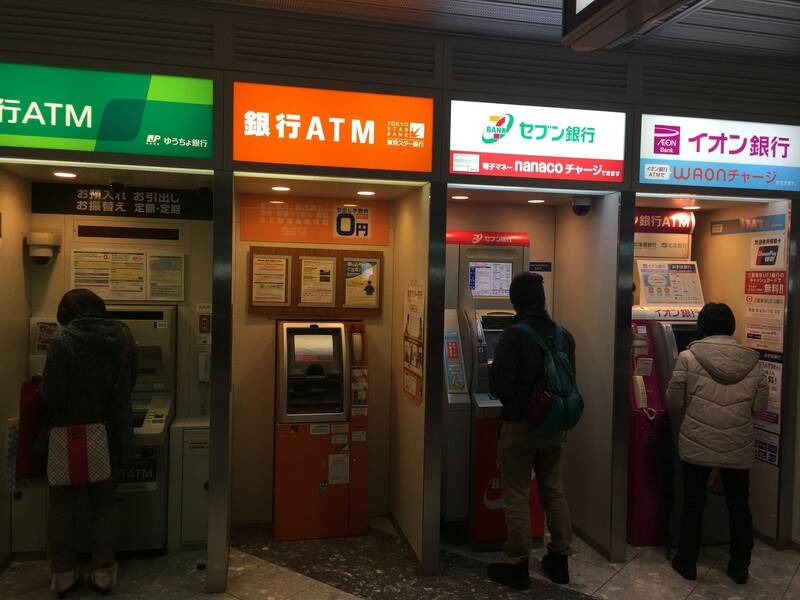 Despite being so cash-reliant, banking here in Japan is a challenge too, as someone recently also wrote about in the Japan Times. So, to exist in this cash society I really need to rely on my foreign ATM when credit cards aren’t accepted. Hence, 7-Eleven is part of my weekly routine. Contrast to life in Silicon Valley, where I rarely take cash out of the ATM. I pretty much pay for everything on my credit card (which I use as a debit card as I pay every monthly balance on time) back in the U.S..
My banking in the U.S. is done online (though it is archaic that personal checks are so heavily used in the U.S. still), though it is even easier in Australia where direct payment to friends can be done as free bank-to-bank transfers. U.S. Challenge – Could I live for a week on credit only? I was just in the U.S. for eight days and challenged myself to go the whole time without having to visit an ATM or use any cash. I was doing great up until Day 6 when I had to visit an ATM…. Turned out that a minor alteration I got done at my hometown tailor only cost $3 and they wouldn’t take a credit card. So for the price, I broke down and went across the street to the ATM. I needed cash to pay our babysitters anyway….though I bet they would have taken PayPal if I’d asked! Is Japan behind, or just getting ahead faster? An interesting contrast in this highly based cash society is that the Japanese are very high tech in the use of prepaid cards to pay for many things. Perhaps Japan is just leapfrogging credit card technology. In many cases, stores, subways and supermarkets take preloaded cards called Suica or Pasmo. You just tap the card over the sensor and your money is deducted. Even easier than a credit card as you don’t have to actually take the card out of your wallet. They are on to something here! Who needs a credit card to be swiped when you can just tap and go? How does this relate to Lean and kaizen thinking? How does Japan’s reliance on paper money relate to Lean and kaizen thinking? I’ve been thinking about these concepts and phrases in relationship to the Japanese use of money and paper systems, but it’s a stretch… I know that payment systems are complicated and different governments incentive the development of these systems differently. Perhaps there is an element of staying with tradition and simpler systems. I do also think there is an element related to tactile object appreciation, which I’ll be writing about in a future post. If you have any insights into why paper money still rules here – or why it is so challenging as a foreigner to use banks in Japan – I welcome your insights in the comments below! 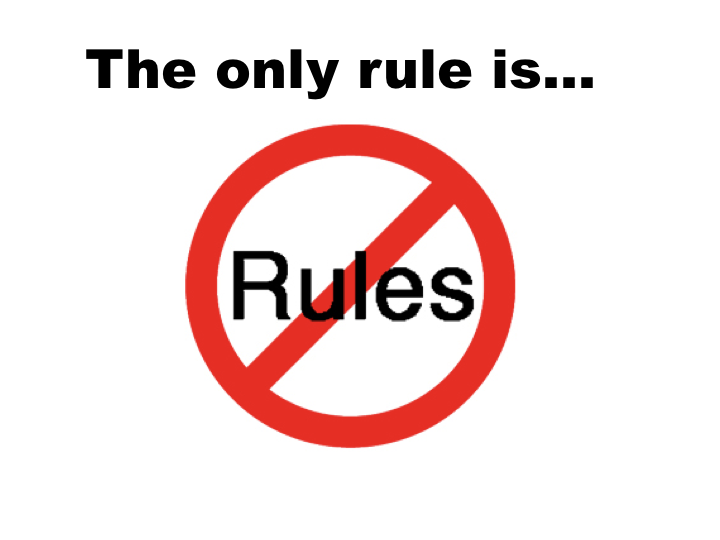 Don’t miss out on future posts about lean, leadership and life in Japan. Sign up below to be the first to know about when new posts are published.